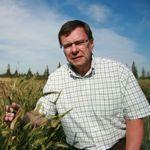 Bruce Coulman is a professor in the Plant Sciences Department at the University of Saskatchewan. He served as head of the department for an eight year period. His research program focuses on the breeding and genetics of perennial forage grasses and annual cereal forages, and he also carries out research on forage agronomy and grass seed production. Over his 40 year career, he has been a professor at the Macdonald Campus of McGill University, a research scientist at Agriculture and Agri-Food Canada, and has been in his present position at the University of Saskatchewan since 2005. Yining Liu and Bruce Coulman. 2015. Morphological and Agronomic Variation of Puccinellia nuttalliana Populations From the Canadian Great Plains. Can. J. Plant Sci. 95: 67-76. Bruce Coulman, Heather Loeppky, and Martin Entz. 2015. The effect of late fall seeding time on the seed production of Italian ryegrass. Can. J. Plant Sci. 95: 641-645. Bruce Coulman, Ajay Dalai, Emily Heaton, Camilo Perez Lee, Mark Lefsrud, David Levin, Peggy G. Lemaux, David Neale, Sharon P. Shoemaker, Jaswinder Singh, Donald L. Smith and Joann K. Whalen 2013. Developments in Crops and Management Systems to Improve Lignocellulosic Feedstock Production. Biofuels, Bioproducts and Biorefining 7(5): 582-601. Yining Liu, Yong-Bi Fu and Bruce Coulman. 2013. Evaluating Genetic Variation and Relationships Among Puccinellia nuttalliana Populations Using Amplified Fragment Length Polymorphism Markers. Can. J. Plant Sci. 93: 1097-1104. Surya Acharya, Edmond Sottie, Bruce Coulman, Alan Iwassa, Tim McAllister, Yuxi Wang and Jinghui Liu. 2013. New Sainfoin Populations for Bloat-free Alfalfa Pasture Mixtures in Western Canada. Crop Sci. 53:2283-2293.